Some Run Washington featured marathoners had great days Sunday at the Marine Corps Marathon, but many missed personal time goals fighting strong headwinds and battling sinus issues. Still, each said they loved the experience of seeing the crowds and crossing the finish line. See below to check on how each runner fared. Jenn Pellegrino had a 26.2 mile birthday party at Sunday’s Marine Corps Marathon. Pellegrino finished the race in about 4:40 and said she “had a blast.” She’s run three marathons in the past month, so went out with the intention to take it easy and just enjoy the atmosphere. “The Marine Corps is so special, I never try to push it,” she said. Though she has nothing on the calender officially until the Big Sur Marathon in April, she said she’ll likely sign up for a couple other marathons before the end of the year. “That’s to be determined, but I usually don’t go more than a few weeks without running a race,” she said. Breanna Gawrys was disappointed with her race time, but enjoyed the atmosphere on the course, with crowd support and inspirational reminders of those who had died in war. “Overall it wasn’t quite what I wanted as far as time, but it started off really great for the first 10 miles. I was staying with 3:25 pace group, but I think I went out a little too aggressively. I didn’t feel too great after the half,” she said. 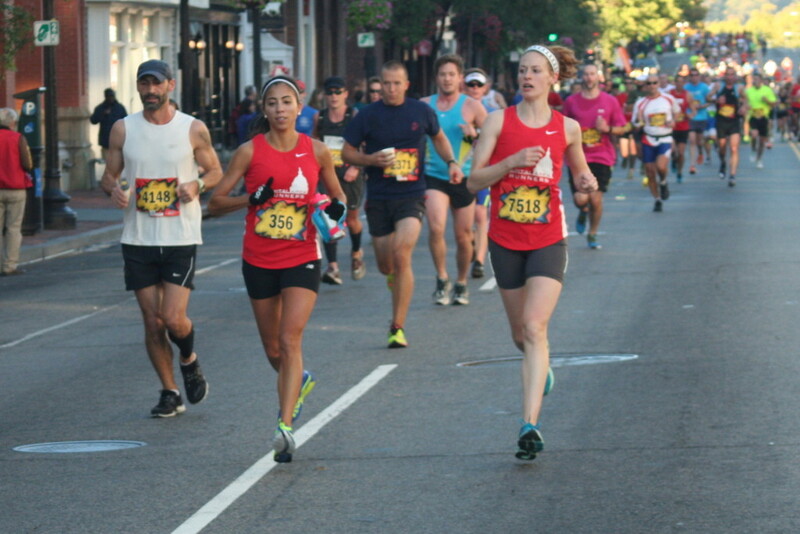 While she thought having more free time to train would leave her better prepared than last year’s race, she ended up finishing in 3:45, slower than her previous year’s time. “I felt more ready, but I hadn’t really done fast long run training. I did my long runs at comfortable pace, and one night of speed work a week. I think I need to do a little bit more tempo,” she said. She ran in a Team Red, White and Blue t-shirt and said the crowd support from members of the military made it so she couldn’t give up, even when she struggled in the second half. One of her favorite parts of the course was the Blue Mile on Hains Point, where pictures of fallen service members line the race course. She said she’ll definitely be back at the Marine Corps Marathon in 2015. In between, she’s already signed up for the Rock ‘n Roll half, but is trying to switch to the full marathon to have another shot at qualifying for Boston. Kelly Swain finished the race in 3:00:55 – less than a minute off her goal of breaking three hours in her first marathon. Despite that, she said she gave the race her all and is happy with her performance. “I would say I definitely gave everything I had, left everything out there. I’m really happy about my time and my overall place,” she said. She said she faced a lot of ups and downs throughout the race – both emotionally and physically – and while no second marathon is on her calender right now, her coach encouraged her to sign up for a flatter race, she said. On most of the course, however, Swain said she was surprised by how many people came out to cheer on runners. Some of her favorite parts of the course were just after Rock Creek Park and around the Capitol where throngs of people lined the race course. “Usually I wouldn’t think with such a big race or such a long race there’d be so many people, but there were people everywhere, which was amazing,” she said. With the marathon behind her, Swain can focus on her next big event: her wedding on Friday. With only a few small logistical things to take care of before then, Swain said she plans to spend most of the week just recovering. Jon Deitchman loved the crowd support in his first Marine Corps Marathon. His favorite parts of the course were just after Hains Point, when spectators started lining the course again, and through the festival in Crystal City. “With the festival they had going on, it was a really fun atmosphere. By that point, you know you’re so close it’s just beating your head,” he said. Deitchman had hoped to break four hours, but ended up finishing in about 4:35. He said started off running with friends and had a hard time moving up around other runners at the beginning. While he may have missed his goal time, he said he was ecstatic just to have the experience of crossing the finish line. He said he hopes to be back out at the race next year to reach his goal time. Jonathan Ferguson finished Sunday’s marathon in 2:58, blaming his missed goal of 2:50 on recovering from a cold and a strong headwind both heading over the 14th Street Bridge and heading toward the finish line. He said his cold has made him miss a few days of training this week and he still didn’t feel 100 percent well for the race. A highlight was getting to run with a few of his former team mates from the University of Maryland. “We sort of missed each other at the start, but when we passed each other through Rock Creek Park, it was very fun to see them,” he said. Anthony Garofano finished in 4:47, missing his goal to finish under four hours. He too was fighting off a cold and taking cold medicine, so said he was overall “pretty satisfied” with his performance in his first marathon. He was reluctant to say whether he’s planning to tackle a second marathon, saying that he’s been told to wait a week to make that decision. “It was certainly painful, but it felt good to finish,” he said. He said his newborn daughter, Helen, was out on the course, including just before the finish line. “My wife brought her out and I saw them a couple times, including just before that final hill up to Marine Corps war memorial,” he said.